Dock building is serious business at Morrison Contractors. From pilings to mega docks or from your backyard project to a commercial marina, we can meet your needs; on time and competitively priced. 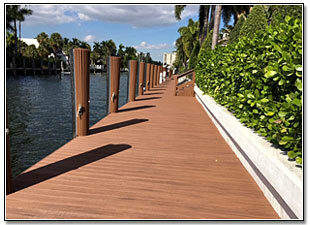 Morrison Contractors has been building docks in South Florida for over 30 years. Morrison Contractors is known for building each project better than it has to be. We always use the finest materials available like marine grade for salt water contact PT pine, stainless steel hardware and PVC composite decking materials. Marine dock construction projects involve many diverse issues such as dock size and location, environmental and regulatory issues, specialized insurance requirements, permitting and governmental compliance. Morrison contractors can construct your new dock from wood, composite material, concrete or any combination of these materials. Wood docks are built from high grade marine pine lumber or IPE. IPE or Brazilian Walnut is one of the densest hardwoods available, three times harder than cedar. Morrison is also a Platinum TREX Dealer and installer. TREX, a popular composite decking material made out of recycled materials, is known for toughness and longevity in severe conditions. Commonly used for walkways and deck surfaces, TREX comes with a factory backed 25 year warranty. 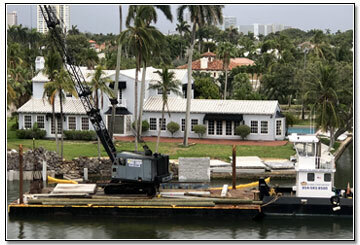 With our own barge and crane, we are uniquely qualified to complete heavy marine construction projects such as: pile driving, concrete panel walls, concrete boat docks, and restoration systems like batter pile driving with new seawall caps. If your dock or seawall requires hurricane approved engineering, we are up to the task. That is why Westrec Marina used Morrison Contractors to rebuild Harbortown; the City of Dania’s public boat ramps and the Hall of Fame Marina. We get the job done on time and without excuses. If a marine project is undertaken without the necessary permits, the owners may be severely fined and/or forced to remove the structure. Our full time dedicated staff of experts has years of experience dealing with dock permitting and compliance. South Florida dock construction projects are regulated by local and county zoning departments as well as State environmental agencies. We file and obtain all required permits for your project and walk the construction through to completion. A Morrison dock is always properly permitted and built by skilled craftsman who know they are working for a contractor with a serious commitment to quality. In addition, Federal regulations require contractors involving construction over water to obtain Longshore and Harbor workman's Insurance. If a construction death occurs on your project without this insurance, you could be held personally liable. Morrison Contractors is a licensed Florida Marine Contractor and carries all required State and Federal insurance coverage. How long will it take to build my dock? On average the permitting process takes approximately 30 days to complete. There could be issues that prolong that window. Morrison's experienced staff has dealt with numerous extraordinary situations and will work hard to resolve them as quickly as possible. The average construction time is 1-2 weeks. Will my new dock come with a warranty? All Morrison docks are warranted for a full year from date of completion. In addition, material manufacturers such as TREX offer warranties on their products. 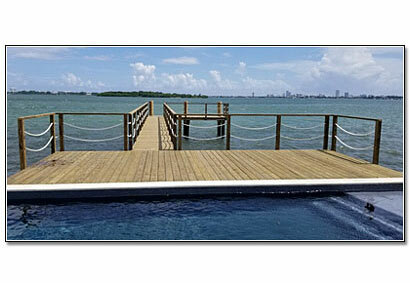 Call today and find out why Morrison Contractors builds the best docks in South Florida. For more information about our products and services, please call us at 954-583-8500 or Email us directly from this website.